Strongly refuting the criticisms by some retired army officials who claimed that they were not content with the battle alertness of the Army at present, the Sri Lanka Army (SLA) says that as a professional army it was taking all measures to prevent any resurgence of warfare. “Reinforcing battalions with a lesser number of troops under the SLA’s right-sizing program has been grossly misinterpreted as the closure of camps by some self-claimed war analysts,” the SLA Commander Lt. Gen. Mahesh Senanayake said. He said that all units under the Security Forces Headquarters, Jaffna had been reorganised under the right-sizing program now and the SLA challenged these war analysts to publicly name any of the operationally important camps that had been shut down. 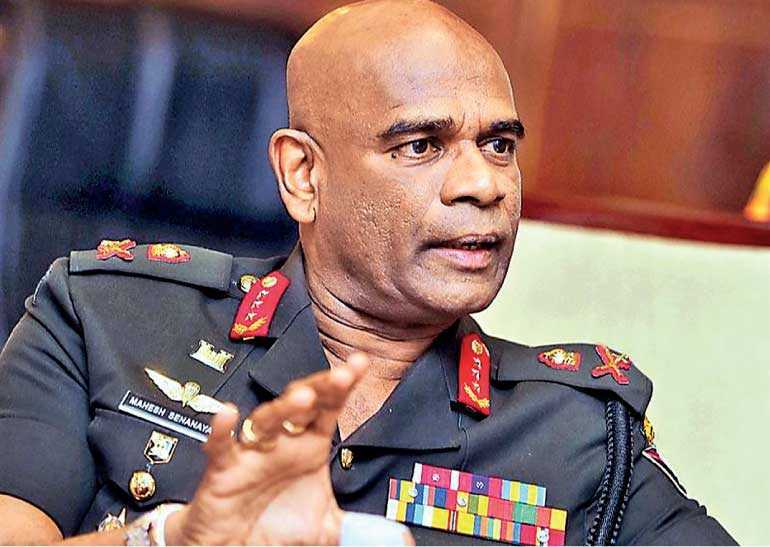 “It is not ethically right for someone to review the status quo of the Army and its battlefield preparedness from outside after having gone on retirement years ago and they also have no moral right to hurl such allegations,” Lt. Gen. Senanayake said. According to the SLA chief, the relocation of camps that remained upon the culmination of the war and also afterward did not in any way amount to any lapse and such alterations were done after assessing security developments at the ground level following on from the recommendations of respective field commanders. He said that the SLA, with the objective of strengthening itself further when necessary, had consulted former commanders and retired officers with battle experience with good faith and the Army would also continue such practices unfailingly in the future. “These officers intend to serve their own personal and political agendas. We request the people to ignore these comments and to keep confidence in the SLA, which has defended our country in the past,” he noted. In a press statement clarifying the status quo of SLA’s security preparedness, SLA’s media director Brig. Sumith Atapattu stated that under the SLA’s right-sizing program the SLA had taken all the necessary measures to place all battalions and units on alert to face any eventualities in an organised manner.